Amazingly Sweet and Emotional Read! "Cade Montgomery crashed into my life, literally, and now I never wanted him to leave. He was my salvation." I sit here and I’m still in awe after finishing this book, not even sure where to start. Before I start let me just say my review won’t matter as your reading this amazing story. Everyone and I mean everyone will take this story differently. If you are in a hard place this is the best book for you hands down. Everyone needs a little Rae of Sunshine. Trust me grab your copy today and I can promise you won’t be disappointed. This story told for Rae “Rachel” Wilder’s point of view. It’s written amazingly well. Michalea has a new reader in me. 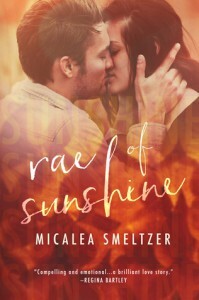 "You're my Rae of Sunshine, and I mean that. Before you, I was a ghost in my own life. You woke something up in me." Rae Wilder is a broken girl who has never dealt with a horrible tragedy. She’s now running from her past. She moves to a new town, 3 hours away to a new college. All she wants is to be left alone, no friends. Just her camera and classes. What she wasn’t ready for was her roommate Thea. Can Thea bring Rae out of her funk? "I hadn’t been looking for love. Or a lot of things. But the things you think you don’t need can turn out to be exactly what you didn’t know you were searching for." Cade Montgomery is the college football star. Though he isn’t your natural football star. He’s sweet and caring, very much determined but patient in his pursuit of Rae. Did I mention Cade is Thea’s (Rae’s roommate) older brother? Well he is! Makes for a crazy time. Hee Hee. Cade know his fair share of tragedy and is living through the pain. "My skin was warm despite the cool temperature and I felt almost drunk—drunk on life, maybe, because for the first time in a long time I was happy to be alive." Will Cade be Rae’s strength when she has none? Will he give her the loves she needs? What will she do? Is there anything he can do? Will they get their happily ever after? I guess you will just have to read and found out! "Memories have a way of haunting you for the rest of your life. They don’t just go away. They become a part of you—an essential element of your make up." Oh hell I forgot to add there are a few major twists that you will not be expecting. Well I know I wasn’t. Also be prepared you will get brought into the story while reading as if it is you going through this. With that being said I want to thank Micalea for writing such an amazing story. Now after all this I have to sit and wait for the next one. I do wonder if we will get any more Rae and Cade. Oh Maybe Thea and Xander or even Nova and Jace. Hmm I suppose I will have to wait and see.